From the moment Parker did his first watercolor masterpiece earlier this year, I envisioned having some sort of display for his works of art. We had the perfect spot in the hallway to his room upstairs, right off the playroom. The upstairs is full of funky sloped ceilings, so this hallway has a wall that's only half height - which would place the art low and perfect for little man to view. I decided on a six-clipboard grid to display pages. 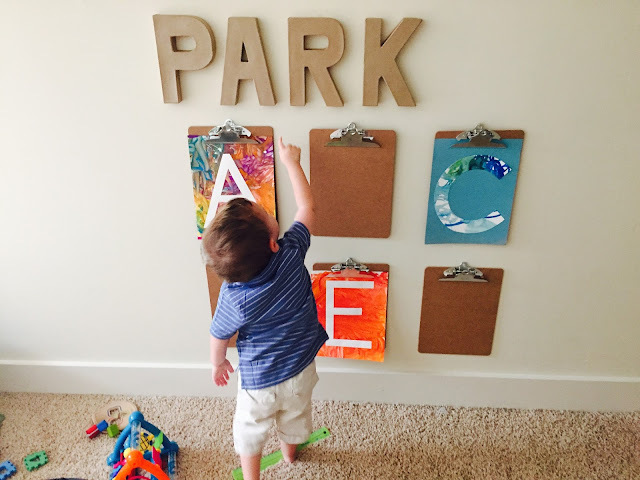 I knew I wanted something that would allow me (and eventually him) to easily interchange the pieces and clipboards seemed like the perfect answer. 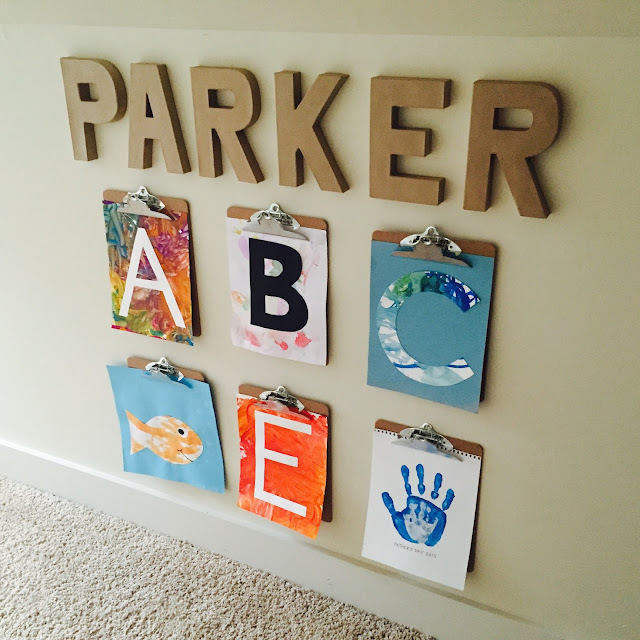 I conferred with hubby about the title, and he suggested we go with "Parker" instead of "Art" as I had originally planned. I love this change because it made little man even more excited about the addition. The entire process was so easy I did it with my two-year-old helping. First, I bought two sets of these clipboards and just eyeballed them into a grid, using a ruler (see the green stick under Parker's feet??) to space them approximately four inches apart. I used a pencil to mark where I wanted the nail to go for each clipboard, and just worked my way one by one until they were all hanging on the wall. For the letters, I found four-inch cardboard ones on sale (score!) at JoAnne's. I liked that the cardboard was the same color as the clipboards (made from recycled materials) and that they were both neutral so that the art is what really stands out. We had a package of these wall hooks on hand, and I took the extra stickies, cut them in half, and used one each to stick the letters directly to the wall. Again, I just eyeballed it, starting by placing the middle letters and working my way out. So what do you think - is it going to last?? How do you display your little ones' masterpieces?? 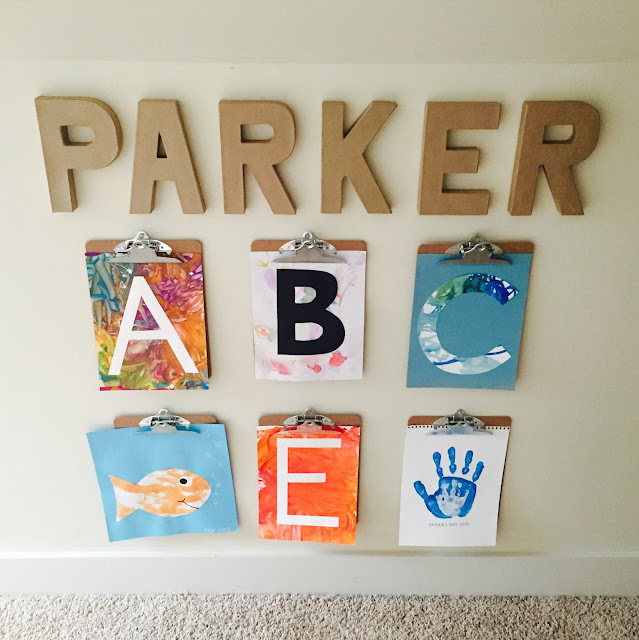 What an awesome way to display artwork! I like how easily you'll be able to change things in and out as he creates new masterpieces. I love this! It's so sweet! This is fabulous. I seriously may need to copy this idea for our playroom. Elyse painted EIGHT pieces of paper the other day and it'd be great to have somewhere easy to display them!